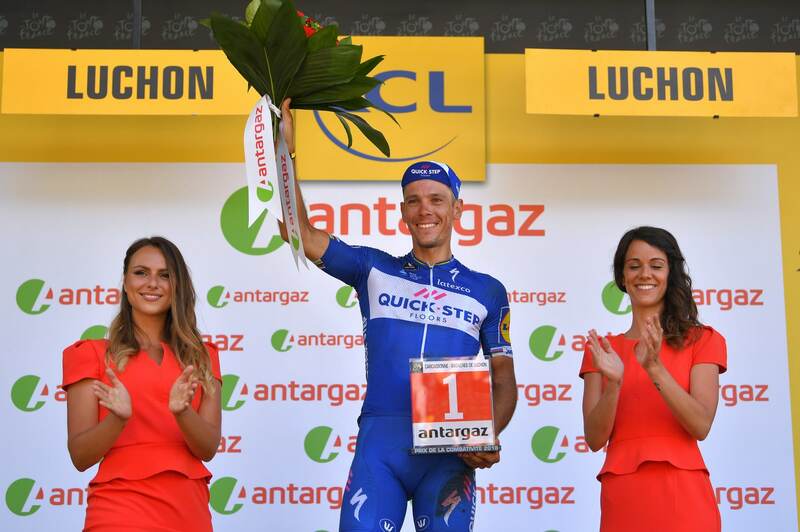 Quick-Step Floors’ rider kicked off week three with a bang, taking his second win and extending the lead in the KOM standings. “Today it was a really crazy day. I had pain in the legs, but I don’t think I was the only one suffering. I knew the finale, with the climb and the downhill, but I still can’t believe that I won again. 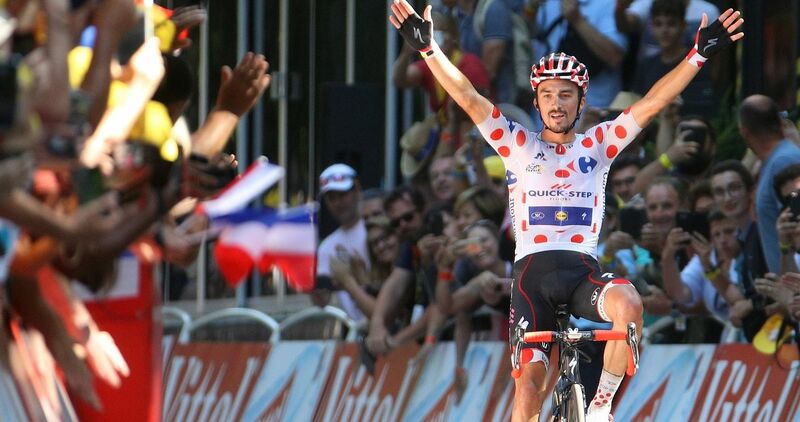 Taking two victories, one in the Alps and another one in the Pyrenees, is mind-blowing, I will never forget this day”, an elated Julian said after another stunning ride. Philippe Gilbert was set to play an important role in the service of his French teammate, and for that very reason, the 36-year-old attacked on a downhill section taking to the foot of Col de Portet-d’Aspet, which was making its 33rd appearance in the race. The former World Champion dully stretched out the gap to a minute over his former breakaway companions, cresting the summit of this legendary climb in the lead, a feat no other Belgian had managed in the past 58 years. After attacking inside the last four kilometers of the climb, Adam Yates (Mitchelton-Scott) looked to be in prime position to take the win, but Julian knew the race isn’t over until it’s over and jumped from the chasing group, getting out of the saddle and reducing the Brit’s margin by the top of the climb, before showing endless guts as he started a mad pursuit on the sinuous downhill. Seeing Julian Alaphilippe tucked over the Specialized Tarmac which carried him to victory in Le Grand-Bornand last week use the mad descending skills he possesses on the descent to Bagnères-de-Luchon was like listening to Pink Floyd’s “The Dark Side of the Moon” on any given evening, pure joy. 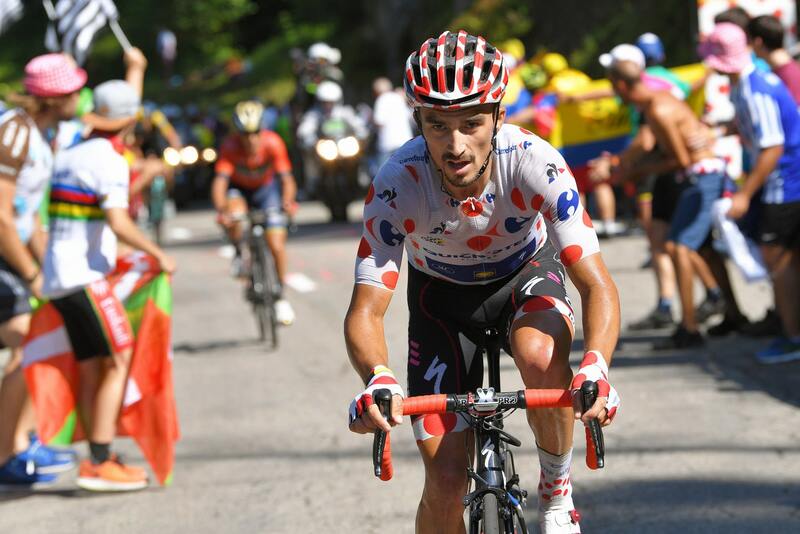 The 26-year-old halved Yates’ advantage until with seven kilometers to go, when the Brit made a mistake in a corner, crashing and leaving in the lead Alaphilippe, who soared to his seventh victory of the season, by far the most successful since turning pro with Quick-Step Floors. “The last 20 kilometers were very intense, with a lot of attacks and cat-and-mouse game in the escape. When I got word that Yates opened a half a minute gap, I decided to attack and managed to pull him back to ten seconds by the time he crashed. It’s never nice when this happens to someone, and I waited for him, but then I saw he was hesitating a bit, so I continued my race. Getting the victory in this town which is inextricably linked to the Tour is incredible, I would have never thought of this, and it makes me really proud to be on the top spot of the podium. “The race and fight for the KOM aren’t over yet, but I am very motivated and confident”, explained after Quick-Step Floors’ 51st win of the season Julian, who referred also to the incident in which Philippe Gilbert was involved. Unfortunately, further examination at the Toulouse hospital revealed that Gilbert had suffered a fracture on the lateral pole of his left patella, a blow to the Belgian’s hopes of completing the Tour de France: “First of all, I want to say that I’m happy to be here after that tough moment. I landed pretty hard on some stones, and initially didn’t want to move, but someone from Mavic came and helped me stand up and crawl back from that ravine. This isn’t how I wanted to finish my Tour and leaving it like this really hurts”, said Philippe, who was rewarded for his amazing effort with the most combative rider prize, which he got for the third time in his career. Gilbert’s crash on the treacherous descent of Col de Portet-d’Aspet was the second setback of a bittersweet day for Quick-Step Floors, after the abandon of Tour de France debutant Tim Declercq. “El Tractor” was one of the unsung heroes of the race and a vital helper for the team, but was forced to call it a day due to illness, just five stages from Paris.